Hold up... 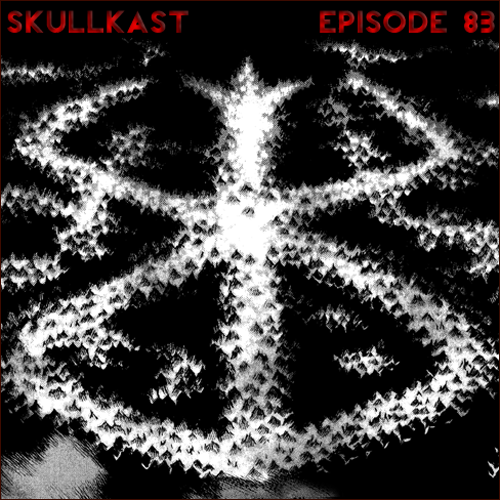 Episode 83!? Download it while still you can! Events coalesce as Albion's destruction continues, bringing Volume 20 to a swift end. Guts comes face to face with a branded land, and a vision of his enemies. We absorb one of the biggest spectacles in all of Berserk, as we round the corner on yet another. Thanks for this latest installment, y'all! I enjoyed it! I thought it was neat that you brought up the special font that's used for the Beherit apostle. I like it a lot because it helps flesh out the character for me in a couple ways. It suggests how his voice would sound. It makes me think his voice would be soft, strange, and reedy. Also, the font makes me think of what he says about his own life: "I'm nobody, never having been anyone, known by none, buried in oblivion am I." The way the font is very thin and small is like how he sees himself. I don't even know if these were the intentions for making the font that way or not, but it's why I like it. Anyway, Mozgus' bird disciple will now forever be known as "Birdo" to me. Love it! Thanks! I already forgot what the quiz question was going to be. I was just kidding about adding a question to the quiz. There was a struggle to remember some names : Pepe, Fouquet and Lucie. I definitely couldn't remember, but it cracked me up a bit to hear you guys get stumped for a second. Actually I'm pretty sure that question's already in the quiz. You constantly see variations on the theme in Japanese media. Yangus from Dragon Quest VIII is a famous example. Azan will die standing upright. You heard it here first . No, it's more likely he's based on the Chevalier de Bayard, whose deeds played a major part in establishing the archetype of chivalry. For reference, below is a famous depiction of his battle on the bridge of the Garigliano, which he is said to have defended alone against hundreds of enemy soldiers.